Today’s Obsession – The Pioneer Woman – You too can become obsessed on February 14th. Stalker, Fan, Too much time on my hands, Never got the benefit of stalking Oprah, Nerd. Whatever you want to call it, I am obsessed with Pioneer Woman. I wouldn’t say it’s completely unhealthy. I mean, it’s not like I want to drive up to Oklahoma and meet her in person or anything. Oh wait. Nevermind. I consider it an obsession because I check her site constantly for updates. Oh, and I read archives from her blog. And I purchased her cookbook and her soon to be out romance novel. And on the whole, I pretty much like 90% of everything she suggests. And I am constantly making comments to my husband about how “I read on Pioneer Woman…” Oh my word. But, I feel like I learn something new each day. Not just about how to use Photoshop or learning new recipes, but I feel like I learn things about myself. Like, I love baking. That’s right my Paleo Crossfit people. I LOVE to bake with flour and sugar and pre-packaged processed foods. Gasp. So glad I got that out. I’ve been feeling guilty because I really want to make the Pistachio Cake and Pig Cake. If anyone wants to come over and eat these desserts so that I don’t eat them myself, please call, text or e-mail. I hate to waste food, but I also hate to eat it all. I don’t really hate to eat it all, I just don’t like what it does to my body. And frankly, her blog is also entertaining. She’s funny and the photographs are great. The blog gives me a view of what it’s like to be optimistic and not take things too seriously. And folks, when I say I take things too seriously. Well. I mean it. Seriously. No really. I mean it. What can I say? I never became an Oprah fanatic. I’m so not into American Idol. The Bachelor is a waste of my time which I find ironic considering I watch shows like Pretty Little Liars and Gossip Girl. That’s right I admit it, I watch teenage shows. Oh well, no one is perfect. Plus, how will I ever learn about the scandalous lives of Manhattan’s elite? Wow, I’ve clearly been in the need to confess some of my guilty pleasures. I really love the picture above, because as you can see by the looks on people’s face, I am not alone. I sent this picture to my husband recently because I wanted to reassure myself and him that I am sane. Or maybe I’m insane, but at least there are others like me. Maybe we can start a support group. Anywho. 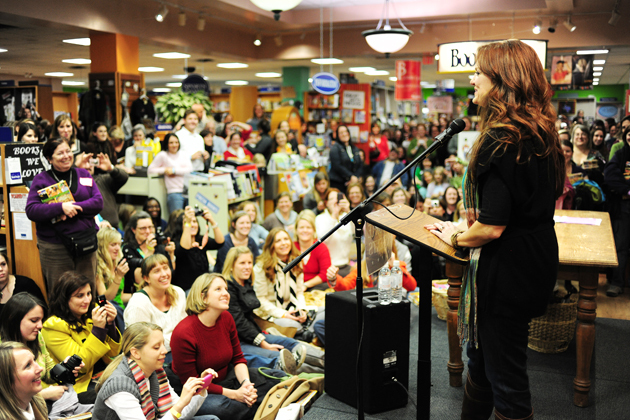 All this to say The Pioneer Woman is coming to Dallas for her book tour. OMG. Some people get excited about Justin Beiber and Twilight and others are saying OMG about the Jacob Lawrence: The Life of Toussaint L’Ouverture museum exhibit at the DMA . Me, I get excited about Twilight AND The Pioneer Woman’s book tour. If you’re interested in attending the book tour, and don’t want to look like the only obsessed fool hanging on her every word. Let me know. February 14th at 6pm, we can look like fools together 🙂 If you have amazing Valentine’s Day plans on a Monday night and you don’t care about Pioneer Woman, have fun! Here are the complete details in case your interested – 2011 Book Tour Schedule. Maybe I can have her autograph Lola? Too much?